At Dentiform Australia, we use IPS e.max because its metal free and durable and mimics the optical properties of natural enamel. We use two dfferent kinds of material, IPS e.max Press, a high-strength glass-ceramic and IPS e.max ZirPress, an aesthetic glass-ceramic which is pressed onto zirconium oxide in a fast and efficient procedure. 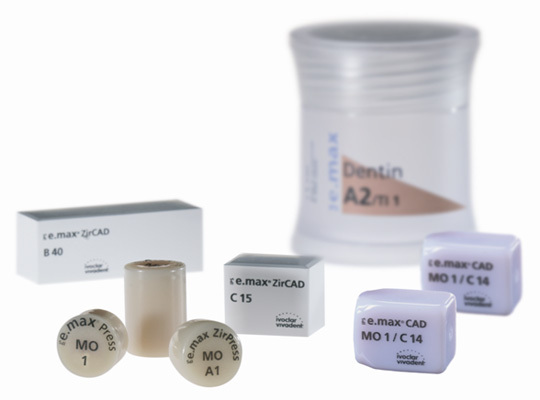 The nano-fluorapatite layering ceramic IPS e.max Ceram completes the all-ceramic system. This material is used to veneer all IPS e.max components, no matter if they are glass-ceramic or zirconium oxide. IPS e.max Press are biocompatible lithium disilicate glass-ceramic ingots. They offer the fit, form and function which is expected from pressed ceramics. In addition, they offer improved flexural strength (400 MPa). With optimised aesthetic properties creating all-ceramic restorations that offer true-to-nature results. IPS e.max ZirPress ingots take advantage of the accuracy of fit as well as the strength of zirconium oxide-reinforced restorations. IPS e.max Ceram is the connecting element between the different components of the all-ceramic system. Because we only have to use one layering ceramic, it enables us to achieve highly aesthetic results on glass-ceramics as well as zirconium oxide.